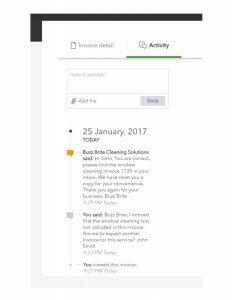 Starting January 2017 we have introduced an updated and interactive invoicing system that will allow our customer to easily lookup, pay and get answers to their questions related to their invoices. To ensure this system is working for you, please find below tips and answers to frequently asked questions. New Feature! Easier way to ask questions about invoices. Now you are able to post private questions regarding your invoice by opening the “Activity” tab of your online invoice. This feature allow you to receive answers to your questions as well as keep a record of the conversations. How will I receive my electronic invoices? At the beginning of your dealing with Buzz Brite, we will request from you an email address we should use for invoicing purposes. After our services has been completed, you will receive an email at the address you indicated, displaying a summary of the amount due. Please select “View Invoice” for the details of the service you received and other options. Why did I not receive my email notification yet? Possibly we haven’t sent your invoice yet. It usually takes 3-7 days from the servicing date for the system to send your notification. If you have any questions regarding your invoice please email us at accounting@buzzbrite.ca. If more than a week has passed and there is no sign of our email in your inbox, it is possible that your email provider marked it as “spam” and it placed in your “spam” or “junk” inbox. What if I want my invoices mailed through the postal mail instead? We will gladly discontinue sending you electronic invoices and start sending them through the postal mail. Please allow sufficient time for the envelope to reach you as postal services vary in delivery time. Can others see my invoices? Only the recipient of our electronic invoice email has access to viewing the indicated invoice. Since the email contains the link to viewing the information, if the recipient decides to forward our email to others, they will also have access. It is good to know that this system only allows access to the indicated invoice, and not to the entire customer invoice history. All invoices (electronic or postal) only include the information the customers have agreed to display. This could include the company name, accounts payable contact name, phone number, and billing address. More information: We want you to feel at ease when dealing with us, so please contact Brian Busby at bbusby@buzzbrite.ca or (250) 540-8716 if you have more questions.